Technology Salon Helsinki kicked off as part of Slush, a fantastic start-up and technology event that takes place with about 10,000 people every Fall in the Finnish capital. Slush added a social impact stream for the first time this year, making it a good fit for Technology Salon. Plan Finland organized the Salon and Netlight hosted. Our topic for this Salon was broad – how can technology increase social impact? – but lead discussants (Jussi Hinkkanen of Fuzu, René Parker from rLabs, and Mika Valitalo of Plan Finland) brought inspiring personal stories, fundamental questions, practical experiences, challenges and questions that made for an intimate and lively conversation that incorporated expertise from everyone in the room. 1. Making a direct contribution to social impact is a prime motivator. Most people in the room who considered themselves to be entrepreneurs or who felt they were working with a ‘start-up’ or ‘social innovation’ mentality had tried different pathways before landing on their current one, yet had found them unsatisfying due to bureaucracy, lack of agility, unsustainable efforts, systems not based on merit, and feelings of not being able to input into or control decisions. “Do I want a job where I’m comfortable, well-paid and getting accolades for the supposed social good I’m doing, but where I know I’m not having any real impact, or do I want to be somewhere that I’m paid less but I’m actually doing something worthwhile?” summed up one participant. 2. It’s not clear how to best achieve social impact at scale. There was some disagreement in the room regarding whether it was better to work outside of the system to avoid the above-noted problems with corporate social responsibility efforts, governments, multi-laterals and international development agencies, or whether it was imperative to work with those institutions in order to achieve longer-lasting impact at scale. Questions were also raised about what is meant by scale. If we help communities to demand better government services through some kind of innovative approach, that can also lead to a scaled impact and more resources and social good coming into a community, even though the scaled impact is not so directly attributable. The big question is how to achieve scale yet remain locally relevant and contextually sensitive. 3. Keeping a social impact focus is a challenge. It’s critical to think about both social impact and sustainability from the very beginning, participants agreed. A social impact start-up, like any business, needs to pay salaries and other costs, so it needs a good business model that brings in enough revenue. “If you do not show revenue and growth, you will drive off investors,” said others, “and then your start-up won’t grow.” Yet those in the lowest income bracket will not have the highest capacity to pay for services, and donors often have policies prohibiting them from funding profit-building entities, even if they start off as non-profits. Ensuring that investors have a social impact motivation so that the mission of the start-up does not skew as it grows can also be a challenge. This area is being somewhat addressed by ‘social impact investing’ however, “as a start-up entrepreneur,” said one participant, “you know that next phase investors don’t like it if you have an impact investor already on board, so that makes it difficult to get further funding.” This all poses real challenges for start-ups. 4. Social good is in the eye of the beholder. Everyone will say that their company is values-based and that it’s ‘doing good’ but who decides on and judges the social function of a company? “Maybe one way is to see if it motivates Generation Y,” said one participant. Another pointed out that one company might be doing something that is perceived as ‘socially good’, but it might have a very small impact. Whereas another company might be doing something not perceived as ‘socially good’ (say, selling clothing) yet it has embedded strong values, good business ethics, pays workers well with good benefits, doesn’t pollute the environment and contributes to local economic growth in a large way. People won’t think of the second company as doing social good even if its social impact is greater than the first company. The idea of social impact is largely in the mind of the beholder, concluded one person, it’s in the psyche. 5. Staying true to social impact values in the long-term is difficult. 7. An innovative business model trumps innovative technology. Many of the places where non-profits are working and where people may think about ‘social good’ start-ups are those where the market doesn’t work and people have very few resources. Yet these are the very people we want to support the most in terms of social impact, said one discussant, so how can we do it? Targeting solutions and payment for different parts of the markets might be one way, for example, offering a solution to the segment of the market that can pay and in that way extending the services to those who cannot pay. 8. People won’t think like you think. 9. There is space for various approaches. You won’t want one single product or service to monopolize, said one person. “There are roles and limitations for different entities in any community. There are some non-income generating things that can and need to happen, and that is actually fine. It used to be a charity and welfare mentality, but now we think markets will solve everything. Neither extreme is correct. We need to have space for various partners and efforts.” At the same time, there needs to be space for different partners at different stages in time. It is important for the various partners to understand what their role is. Emergency support is good in an immediate post-conflict stage, for example, but then humanitarian organizations need to step aside and open space for other actors when a community or country moves to a more stable development and growth period. 11. NGOs and start-ups can be great partners. They can come up with ideas from scratch, or they can partner later in the process. NGOs can take advantage of start-up applications and services, whereas the start-ups can find new customers, build a portfolio, do field-testing and get feedback on what to improve with their idea. In addition the two have a lot to teach each other, said one discussant. “NGOs can learn a lot from start-ups about how to operate. They should be learning how to think about iterative improvements, pivoting and changing quickly, failing fast and learning fast.” Start-ups can also learn from NGOs. “Some NGOs are quite good at participatory practices, knowing the community well, collaborating at multiple levels with various stakeholders, communities and governments.” In addition, community-based organizations know the community very well and often work together well with start-ups and NGOs. 12. Pacing and timing can make collaboration tricky. The pacing in these different organizations and partners is quite different, however, and that causes friction and frustration. But even large multi-lateral agencies can be helpful for start-ups who want to gain entry into different countries or communities because they are well-known and because they can provide an ethical and legal framework that helps protect the start-up from making big mistakes due to a lack of understanding of these key elements. NGOs can also serve as a kind of infrastructure upon which to build start-up efforts. Lack of NGO and donor agility however sometimes causes efforts to fail. Hybrid models of funding that can enable start-up-NGO collaboration are needed. One discussant emphasized the importance for start-ups to generate their own funding on the one hand while seeking donor funds for some things too, but never doing anything for a donor that is not part of the organizations core mission. 13. You need to lose the ego. Plan Finland is hoping to continue convening in Helsinki. If you are interested, sign up to get invitations at Technology Salon! 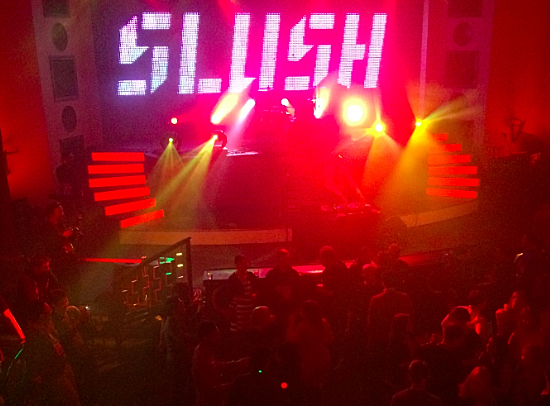 I’d also recommend attending Slush next year – especially if you like high energy, high-tech, Helsinki and lasers! I’m sure next year’s impact stream will be as good or even better than this year. Thanks again to Plan for convening and sponsoring the first Salon, to Slush for including it as part of their Social Impact Stream, and to Netlight for hosting at their beautiful offices!